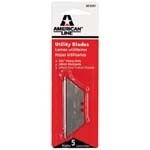 See details AMERICAN LINE 66-0341 2 NOTCH UTILITY BLADE SIZE:.025 PACK:5 PCS. 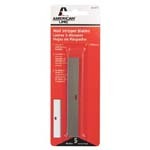 See details AMERICAN LINE 66-0210 ALUMINUM SINGLE EDGE BLADE SAFETY DISPENSER SIZE:.009 PACK:10 PCS. 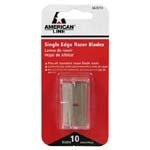 See details AMERICAN LINE 66-0072 3 NOTCH UTILITY BLADE SIZE:.025 PACK:5 PCS. 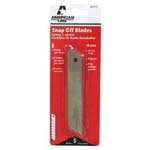 See details AMERICAN LINE 66-0378 BREAK AWAY BLADE SIZE:13 PT PACK:5 PCS. 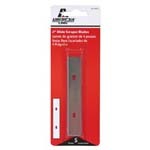 See details AMERICAN LINE 66-0454 WIDE BLADE SCRAPER BLADE PACK:5 PCS. Wide Blade Scraper Blade. .015" Carbon Steel. Fits standard Wide Scraping tools Precision Ground for durability. 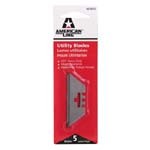 See details AMERICAN LINE 66-0377 WALL STRIPPER BLADE SIZE:4" PACK:5 PCS. Precision ground for stripping wall paper. Made for surface preparation. Fits all 4" stripping tools. 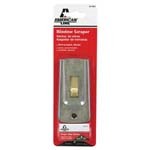 See details AMERICAN LINE 66-0445 METAL WINDOW SCRAPER WITH 5 BLADES. All Metal window scraper. Scrape paint. remove decals. labels. adhesives and more.3 Position carrier for safe scraping. Packed with 5 blades. 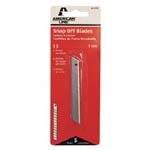 See details AMERICAN LINE 66-0372 SNAP OFF BLADE SIZE:8 PT PACK:5 PCS. 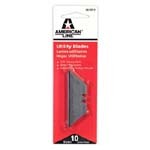 See details AMERICAN LINE 66-0419 2 NOTCH UTILITY BLADE PACK:10 PCS. 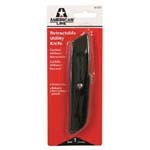 See details AMERICAN LINE 66-0437 ECONOMICAL METAL RETRACTABLE KNIFE WITH 1 BLADE.